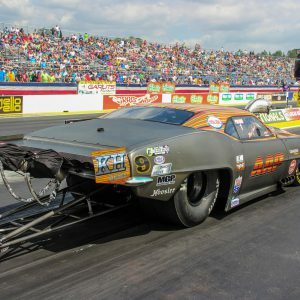 GAINESVILLE, Fla. – It was a final round for the record books today at the 50th annual Amalie Motor Oil NHRA Gatornationals between E3 Spark Plugs Pro Mod Drag Racing series presented by Hoosier Tire and Jerry Bickel Race Cars racers Todd Tutterow and Steve Jackson. Tutterow won the Wally trophy when he got the holeshot win with his 5.662-second lap at 251.86 mph over Jackson’s quicker 5.643 pass at 253.95. 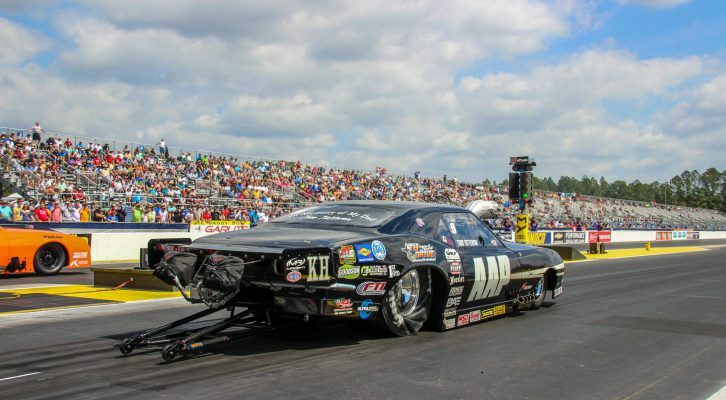 Jackson set the Pro Mod national speed record but came up short for the win. His Gatornationals win is his career first win in Pro Mod. En route to his win, Tutterow defeated Mike Janis, Chad Green and Marc Caruso while Jackson took out Eric Latino, Steven Whiteley and Jeremy Ray. The E3 Spark Plugs NHRA Pro Mod Drag Racing Series presented by J&A Service continues at the NHRA SpringNationals in Houston, Tex. on April 12-14. GAINESVILLE, Fla. — Final finish order (1-16) at the 50th annual Amalie Motor Oil NHRA Gatornationals at Gainesville Raceway. The race is the first of 12 events in the NHRA Pro Mod Drag Racing Series. 1. Todd Tutterow; 2. Steve Jackson; 3. Marc Caruso; 4. Jeremy Ray; 5. Michael Biehle; 6. Brandon Snider; 7. Chad Green; 8. Steven Whiteley; 9. Jader Krolow; 10. Mike Janis; 11. Jose Gonzalez; 12. Jason Scruggs; 13. Khalid alBalooshi; 14. Bob Rahaim; 15. Rickie Smith; 16. Eric Latino. GAINESVILLE, Fla. — Sunday’s final results from the 50th annual Amalie Motor Oil NHRA Gatornationals at Gainesville Raceway. 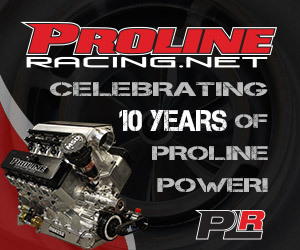 The race is the first of 12 events in the NHRA Pro Mod Drag Racing Series. Pro Modified — Todd Tutterow, Chevy Camaro, 5.662, 251.86 def. Steve Jackson, Camaro, 5.643, 253.95. 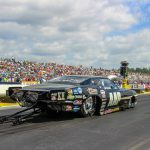 GAINESVILLE, Fla. — Final round-by-round results from the 50th annual Amalie Motor Oil NHRA Gatornationals at Gainesville Raceway, the race is the first of 12 events in the NHRA Pro Mod Drag Racing Series. 251.06 def. Mike Janis, Camaro, 5.758, 247.84; Steve Jackson, Camaro, 5.683, 252.90 def. Eric Latino, Camaro, Foul – Red Light; Marc Caruso, Camaro, 5.707, 250.23 def. Rickie Smith, Mustang, 13.014, 59.07; Chad Green, Camaro, 5.731, 250.09 def. Khalid alBalooshi, Camaro, 9.670, 93.12; QUARTERFINALS — Caruso, 5.724, 246.35 def. Snider, 5.728, 248.43; Jackson, 6.591, 136.58 def. S.
Whiteley, Broke – No Show; Tutterow, 5.684, 251.06 def. Green, Foul – Red Light; Ray, 5.693, 249.35 def. Biehle, Foul – Red Light; SEMIFINALS — Tutterow, 5.665, 251.77 def. Caruso, 21.928, 32.46; Jackson, 5.653, 254.14 def. Ray, Broke; FINAL — Tutterow, 5.662, 251.86 def.Jackson, 5.643, 253.95. 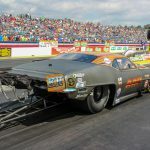 GAINESVILLE, Fla. — Point standings (top 10) following the 50th annual Amalie Motor Oil NHRA Gatornationals at Gainesville Raceway, the race is the first of 12 events in the NHRA Pro Mod Drag Racing Series. 1. Todd Tutterow, 117; 2. Steve Jackson, 98; 3. Jeremy Ray, 75; 4. Marc Caruso, 72; 5. Michael Biehle, 54; 6. (tie) Chad Green, 52; Steven Whiteley, 52; 8. Brandon Snider, 51; 9. Jose Gonzalez, 36; 10. Rickie Smith, 34.